Age 105, born in Seattle to John and Carrie Wahlborg on August 26, 1910, died May 23, 2016. The first of four children, he attended Seward Elementary and Broadway High Schools in Seattle. 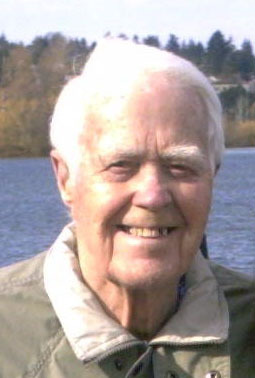 He graduated from the University of Washington in 1932 with a degree in Civil Engineering and as an Ensign in the US Naval Reserve. He then worked for the Coast and Geodetic Survey aboard the MV Westdahl in the Aleutian Islands. While in Alaska, he met and married Anne Anderson of Kodiak in 1933. In 1935, he started at Boeing as an engineer in the Stress unit, working on most airplane models from the B-17 through the 767. He retired in 1975, but continued to work as a contractor for Boeing and other airplane companies for the next ten years. Robert was a member of the Alpha Kappa Lambda fraternity, the Society of Professional Engineering Employees in Aerospace, the Mountaineers, and the Washington Fly Fishing Club. He and Anne loved the outdoor life this area offers. He was preceded in death by his wife Anne, his brothers Karl and John, and his sister Ruth. He is survived by sons Robert and John, granddaughter Heather Galvin, great-granddaughter Kaylee, and many nieces and nephews. Per his request, no services will be held. Really sorry for your loss. I never knew your mom was from Kodiac.